New Delhi: Bharti Airtel Ltd has decided that ultra low-spending customers, those that buy recharge plans costing less than ₹ 35 a month, are just not worth the trouble, as India’s second-largest telecom operator charts out a new strategy to take on rival Reliance Jio Infocomm Ltd, which brought industry tariffs to rock bottom. The New Delhi-based company believes such a step will reduce the number of marginal customers, rein in selling, general and administrative expenses and help focus attention on improving services to better-paying users. Analysts say redrawing its strategy could work well for Bharti Airtel, which has seen revenue and profitability decline in the past two years due to intense competition. During July-September, its net profit plunged 65% from a year earlier to ₹ 119 crore, while revenue from the India business fell 3.6% to ₹ 14,920 crore. “We have about 330-odd million customers in wireless. But if you look at the pattern of consumption... about 100 million customers have very low levels of Arpu (average revenue per user)," Bharti Airtel’s chief executive, Gopal Vittal, said on Friday in a post-earnings conference call with investors. “So these Arpus are at sort of low double digit... In the last one and a half months in three circles in Tamil Nadu, UP West and Punjab, we’ve introduced minimum Arpu-led plans at the low end... We’ve seen some good results in and we’re now rolling it just now across the country—in fact, in the last seven days, we have already rolled out across the country." According to data for April-June compiled by the Telecom Regulatory Authority of India (Trai), Bharti Airtel holds the highest share of the rural subscriber base. Its market share stands at 33.44%, while rival Reliance Jio holds 12.22% share. The picture is starkly different in the total wireless internet subscriber base, where Airtel holds 25.3% share while Reliance Jio has captured 43.8% share. Through its minimum recharge plan, Bharti Airtel has essentially simplified seven or eight tariffs, with minimum recharge plans starting at ₹ 35. “Letting go of customers who recharge less than ₹ 35 a month, particularly those who mostly receive incoming calls or do very small recharges, would also free up Airtel’s network and ease congestion. This would in turn improve quality of service for high-paying users," a person aware of the matter said on condition of anonymity. Bharti Airtel, which has been eyeing a large share of the 4G subscriber additions, is also using content through partnerships with Zee, Netflix and Amazon to prod users into spending more. The rollout of a higher minimum recharge plan across India would also reduce Airtel’s low-end customer base, which the management claims would help improve Arpu, as customers would carry out more recharges. “... If you look forward a couple of years...we should see at the lower end, 100 million customers giving us low double-digit Arpus compressed further by 30-40% and an Arpu upside there," Vittal said, adding that the telecom firm would not compete in the feature phone-user market. Rival Reliance Jio has managed to grow its rural base, thanks to its cheap 4G phone and low tariffs. 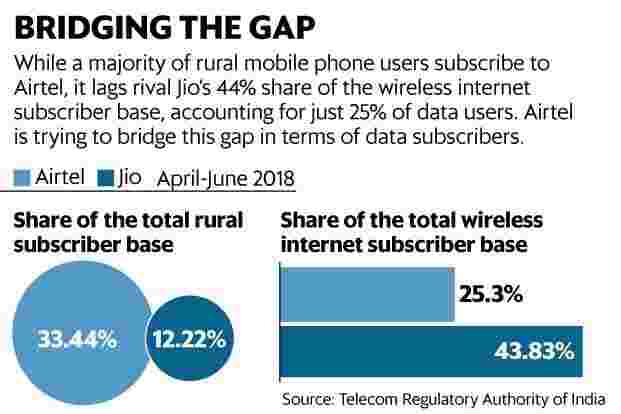 Reliance Jio’s rural subscriber base has grown by half in the last six months—from 46.6 million as of end-March to 73.11 million as of end-August. “The days of endless tactical fighting such as tariff wars are getting over and telcos need to revisit their future business strategy. Bharti Airtel seems to be refining its strategy in this intensely competitive market," said Amresh Nandan, vice president and analyst (tech) at Gartner. “A subscriber is a source of revenue, but it is also a cost to the operator. Bharti Airtel is focusing on the segments of importance, based on their future business plans." An emailed query to Bharti Airtel for details of the revenue break-up from rural and urban regions was unanswered till press time.